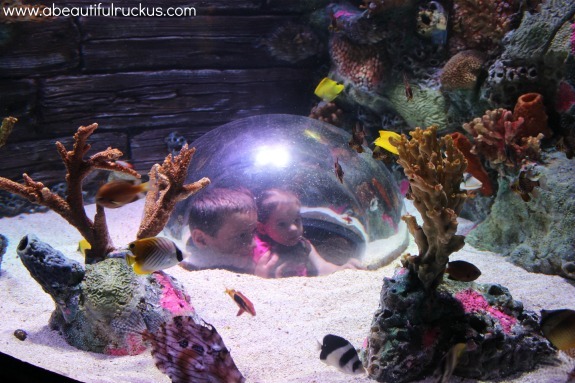 A Beautiful Ruckus: Adventures at SeaLife and LegoLand Kansas City + Tickets Giveaway! 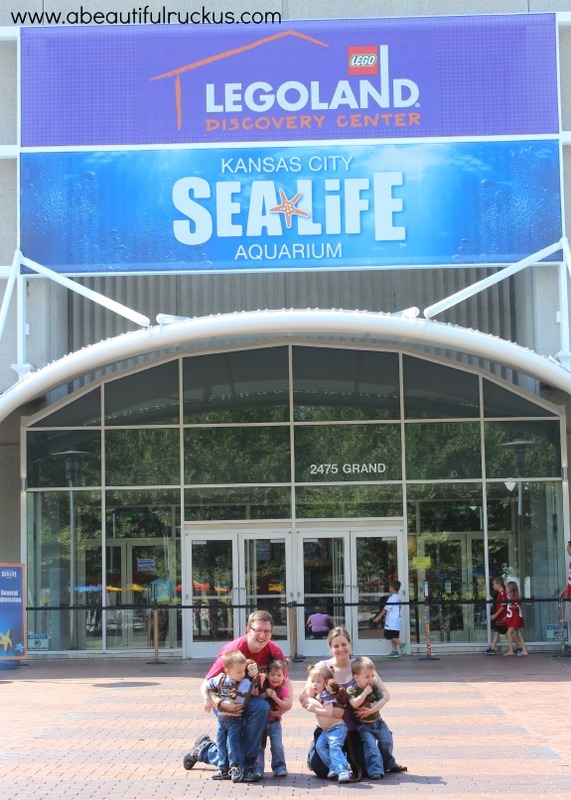 Adventures at SeaLife and LegoLand Kansas City + Tickets Giveaway! Last year, two brand new attractions came to Kansas City! SeaLife and LegoLand opened in joint space downtown, and are now one of the anchors of the Crown Center Shopping area. Last month, they reached out to us and invited our family to come see what they offer to the Kansas City community. We thought it sounded like fun, so we loaded up our kids in the minivan, and asked Beth and her son Gideon if they would like to come with us and help keep track of our toddler quadruplets. We arrived first thing in the morning, and didn't have any lines to deal with which was exactly what we were hoping for! The kids were definitely ready to start their adventures. We started our day with SeaLife. Different rooms had fish that glow, turtles, a touch pool, and every other type of sealife imaginable. The best part? The exhibit was designed for the height of little kids. My kids are only two-years-old, but they were able to see everything without us having to continually pick them up. 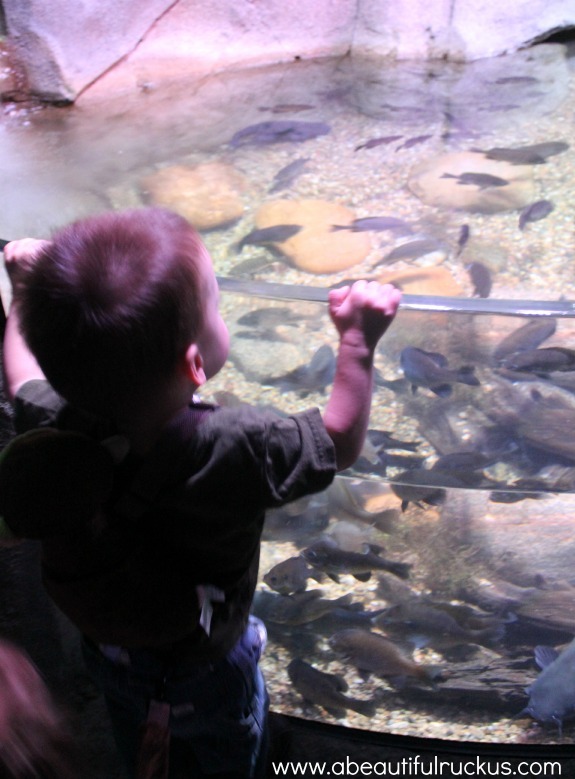 I loved seeing the wonder on their faces as they watched the fish, walking through the tunnels of sharks, and stood on the see through plexiglass to see the stingrays swimming below their feet. It ended up being Caleb and Ellie's favorite attraction since it was quiet and slow moving. It makes sense that they would enjoy it as much as they did since they are our hypersensitive kids. After exploring SeaLife, we took a break for lunch. This was our kids first time walking through something like this, and we didn't want to tire them out too quickly. 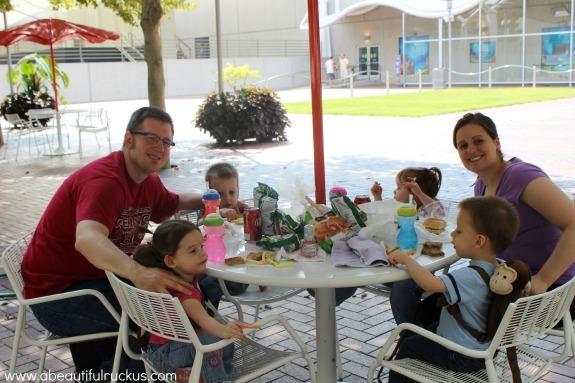 Legoland has a cafe inside their atraction, but the day was beautiful, so we brought a sack lunch and ate at the picnic tables just outside. The kids also had a chance to run around a bit more freely before we went back inside for our second adventure. And then it was time to head off to our second adventure: LegoLand! The first room young builders enter is the Lego "Factory" Room. Here they have some cute "machines" where kids can pretend that they are making legos. 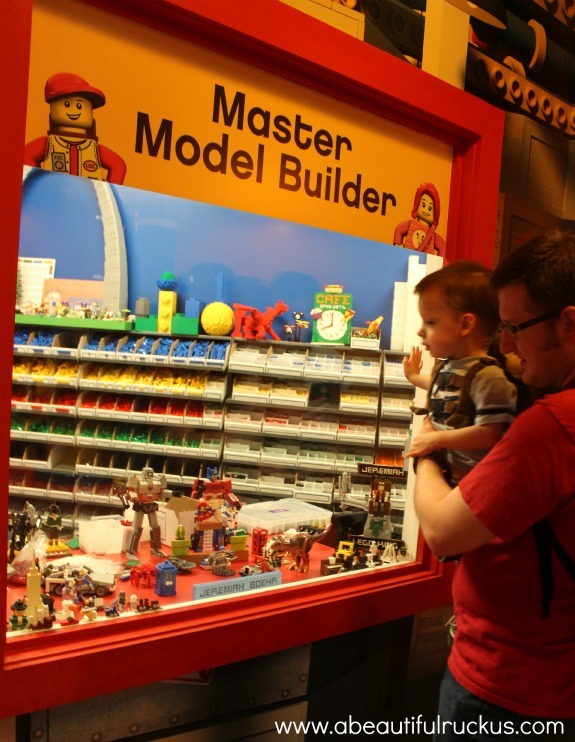 This is also where you can view the Lego Master Builder at work. Caleb is our block builder (using toddler size legos), and he was fascinated by what he saw. There are two rides in LegoLand. We tried one ride where you play a life-size version of a computer lego game and save the princess. 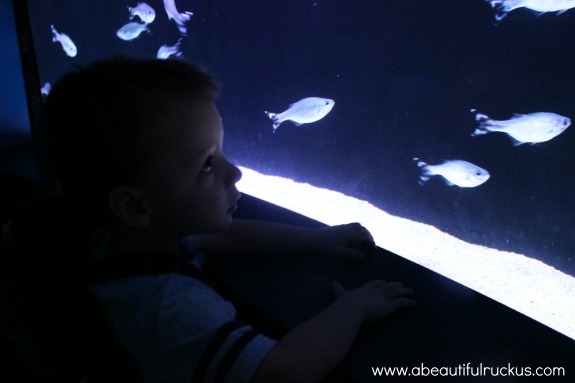 Remember how I said that our two sensory kids really loved SeaLife? Well, let's just say that sensory kids may want to avoid this ride. But Abby and Elijah thought it was fun! In fact, Abby and Elijah quickly decided that LegoLand was definitely more their speed! A word of caution though: If you have little kids, keep a close eye on them in LegoLand. It's easy for them to be entranced with the colors and sounds and wander off in five seconds flat. But it's not like Abby did that or anything. And we certainly didn't end up sprinting around the attraction in a panic looking for her. Or find her next to the exit. That girl cut years off of my life. Sheesh. Anyway, once we found her, we explored the rest of the attraction. 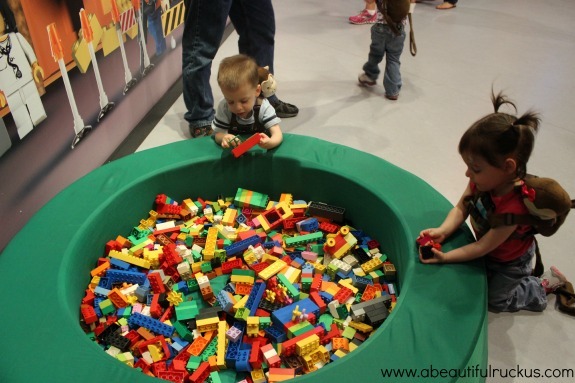 Some of the activities in LegoLand were too old for our kids, so we decided to hold off for a few years until they can really enjoy them. 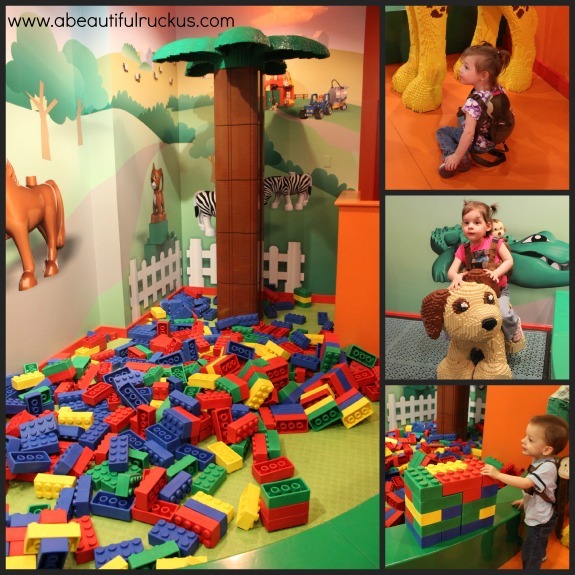 But they did have a fun little nook with gigantic blocks and animals made out of legos! We headed to the toddler area and let the kids play there for a few minutes before we headed home. We were very grateful to have had the opportunity to take our kids to Kansas City's newest attractions and let our kids explore new things. I can easily see the kids getting different things out of the exhibits over the coming years as they grow older. My thoughts? 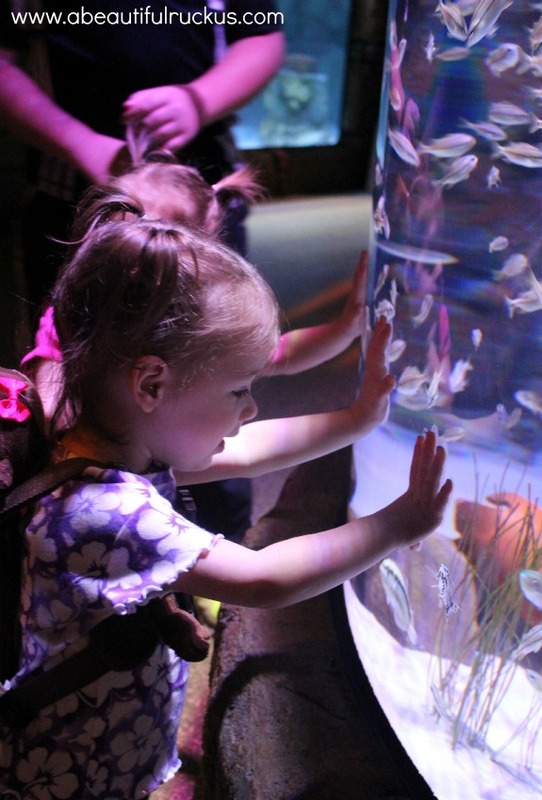 I think SeaLife works for all ages, and is especially friendly to those with sensory issues. LegoLand strikes me as more appropriate for kids around the ages of 5-12. I imagine that this would be the most epic birthday party spot ever for a boy's birthday party! Kids two-years-old and under are free! They do not allow side-by-side twin strollers because the paths are very narrow. Front-and-back twin strollers are allowed, but I think you'd be better off with a couple of umbrella strollers if you have multiples and enough adults to push them. Leave the diaper bags at home and use backpacks instead. It's just easier to carry all that stuff around and keep your arms and hand available for more important things (like keeping track of Abby your kids). Homeschool Week is this week, September 16-20 at Crown Center! Click here for all of the specials they are running, including reduced ticket fees for SeaLife and LegoLand! Get priority access by buying your tickets online. The lines are much shorter this way! Get major discounts by buying your SeaLife and LegoLand tickets online ahead of time. Better than a coupon! Best suggestion: Enter the giveaway below for your chance to win four tickets to each attraction for FREE! 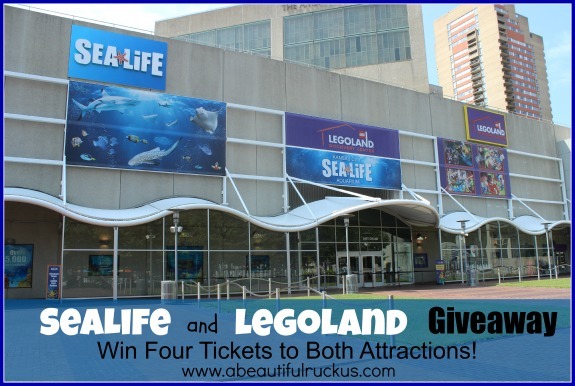 One A Beautiful Ruckus reader will win four tickets to SeaLife Kansas City and LegoLand Kansas City! All you have to do is enter below for your chance to win! The first two tasks are not optional and must be completed to qualify for this giveaway. The additional entry tasks are optional. Winning entries will be validated prior to announcing the winner with an alternate drawn if the entries cannot be verified. The contest ends at 11:59pm on Monday, September 23rd. The winner(s) will be randomly chosen and contacted by email on Tuesday, September 24th. The winner(s) will have 48 hours to respond to the email with their information so that the prize can be forwarded to them. A Beautiful Ruckus is not responsible for the delivery of the prize and is not responsible if the sponsor does not deliver. This giveaway is open to residents of the United States. A Beautiful Ruckus received complimentary tickets in exchange for hosting this giveaway from SeaLife Kansas City and LegoLand Kansas City. No other compensation was provided. This post may contain affiliate links. For more info, please see my disclaimer page. My boys and I have been to SeaLife (preschool field trip), but they're dying to see LegoLand! And I think Lily would love it too - she's all about blocks and building. My boys would like SeaLife. This would be so great to go to...roadtrip!! Been meaning to go to SeaLife! Sounds awesome! We love Sealife but have never been to Legoland. I would love to take Grace. 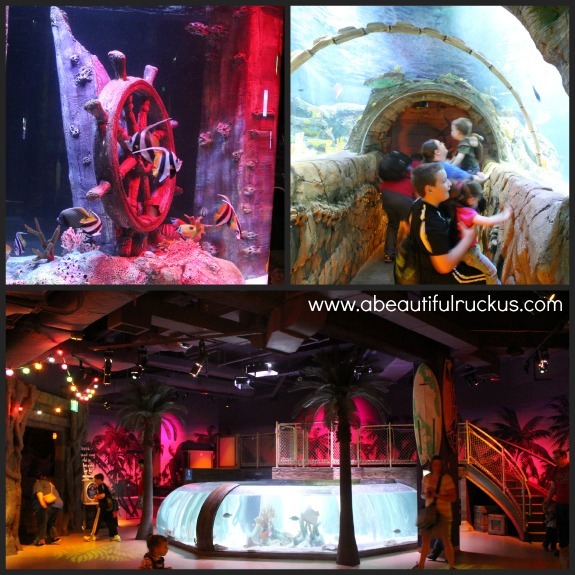 We went to LegoLand last year but have been wanting to go to SeaLife! Both of my kids would love it! Sea land! We love fish! My boys love to build, so I think they would have blast at LegoLand! Lori S.
We've been to Legoland and loved it, but not the aquarium. So, I'd be most excited about that! So excited about this! 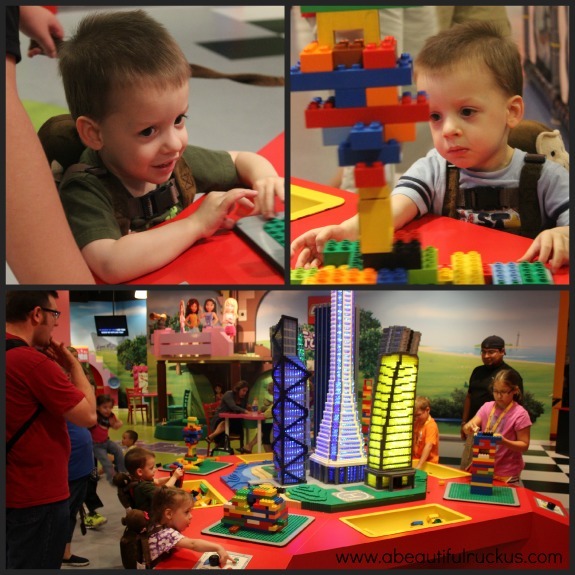 We discovered that they have Legoland in KC now a few months ago and we had three very excited boys! So excited that they asked to go there instead of have Birthday Parties in Nov & Dec! When we come down for Thanksgiving we will be exploring these attractions and talk about it daily! We are excited to be seeing these new attractions in November and also so glad to hear such great reviews of them! Legoland! We have been wanting to go so badly! Cool giveaway Rebecca! It's great to hear your stories of adventures. You know my wife and she's often telling me stories of y'all. I have to say that Legoland is probably the place to go, especially with boys! Our older & younger boys all like Legos...and even our girls are becoming fans, especially the youngest! My boys LOVE Legoland.....they like the ride at the beginning and watching the 4D movies. While we don't live in KC, we make the 3.5 hour trip west to spend a weekend at Renaissance Festival every fall and a weekend at a gaming gathering every spring. I had not heard about these attractions until your post. My husband is a huge LEGO nerd (the 3-teired grooms cake at our wedding featured a Star Wars LEGO battle) and I am in love with sea life. We have tried, on several occasions, to plan a trip to Florida, but money always seemed to go the way necessary big ticket items like a new A/C and a car. A weekend vacation to KC is a much more feasible option even if the attractions are of a smaller scale when compared the major tourist traps. SeaLife looks great! I can't wait to visit! Out of the blue, Mason went from loving trains to loving Legos. They have a Lego area at Wonderscope in Shawnee and he loved it. He will really enjoy LegoLand. I think Sea Life would be so interesting & fun to visit~thank you, not sure if I would use these tickets or give them to my cousin for his kids ..
Legoland! My boys are obsessed with Legos. This is Amanda Goeller and I'm soooo excited to take my daughter to Sea Life for her 3rd birthday! We are going to take the train which she will love! I've wanted to visit these attractions! Very cool giveaway! SeaLife but both would be so fun to visit! What a great giveaway! My 8 year old twins are lego fanatics and would be most excited about Legoland but would love both. Thanks for the giveaway! I have a young Lego fan who would love to take the half day's drive to KC to be surrounded by all of those colorful bricks! What a fun family day! LegoLand for sure! My kids are on the older side and this is right up their alley! I love LegoLand. I grew up in Denmark, the home of the Lego, so it has a special place in my heart. I have been to SeaWorls too and love it. Would like to go back to both places with my kids. 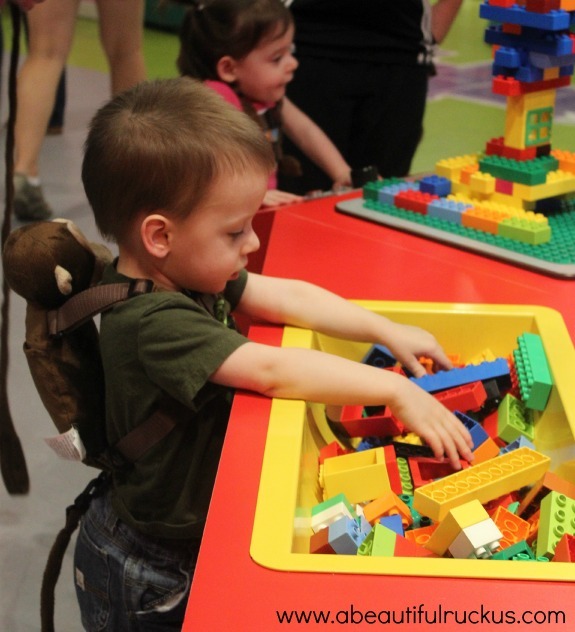 My little one would love to visit Lego Land, he loves all things Lego. We have never been to legoland but my girls love lego friends, so glad they have them for girls now, would love to take them for their first time. My oldest wants to be a marine biologist so the Aquarium would be amazing for my oldest to see. I'm the most excited about LegoLand since we've never been before but I loved the SeaLife the one time we visited (Kindergarten field trip last February). I'm excited to introduce my youngest son to the world of Lego's though! As an adult 'kid' I have been dying to go to Legoland. I would love the check out the aquarium! I'm sure my daughter would LOVE both attractions! Can't wait to experience this with my sons! Janet N - My grandsons love Legoland. They enjoy reading the legoland magazine, as it keeps them updated on new items and give them ideas. They love building with legos. 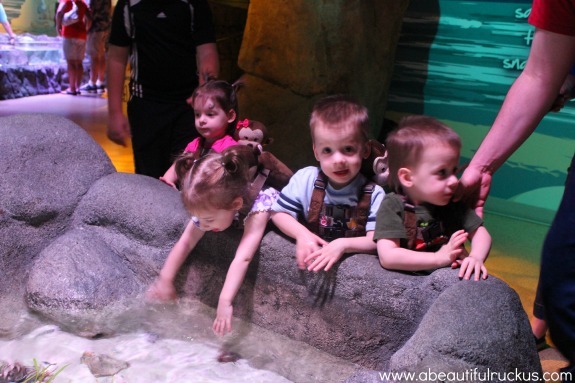 They also enjoy Sealife because it is colorful you can get up close to the animals. Legoland...only because we had an annual pass to SeaLife that just recently expired, but haven't been to Legoland. Legoland and SeaLife are both amazing! I would love to take my children to LegoLand. We visited SeaLife for the first time in August so it would be fun to check out LegoLand this time! SeaLife Aquarium b/c my boys are all about fish and sharks! We loved SeaLife AND Legoland, but I cried when my 11 year old son told me, "I feel like this is my home" while visiting SeaLife. He loved it so much that HE nearly cried!! My son is a serious shark and ocean animal lover. He would be so happy to get to see these animals up close! I know we'd love to see both of them, but my son would LOVE Legoland! Thanks for offering the giveaway! Sounds like so much fun!! Would love to see the aquarium!! We are looking forward to taking our 2 boys there soon! We are planning to celebrate a little early a special 5th birthday for our lego lover! Would love to take my kids to both! They live for legos! I've been to sea life once with my oldest boy for his 2nd grade field trip. It was really cool but very short. I have 3 other children that haven't been at all. I think if we had more time and we could all go it would make it so much better:) And my boys would LOVE LEGOLAND-they are 7,8. I have a 7 yr old son who would LOVE this! We moved to Nebraska almost a yr ago and he's been talking about Lego land for a while! He also loves the ocean as we are from North Carolina! Thanks for having such a great give away! we've tried sea life, but not legoland yet -- would love to take my 4 year old son there! All 3 of my children (and myself and hubby) would love to see Sea life! We haven't been yet and feel like we are missing out. Love that place, but it's EXPENSIVE, so free tix would be great! We would love to visit Sea Life! I have 2 little boys (and 1 big boy!) 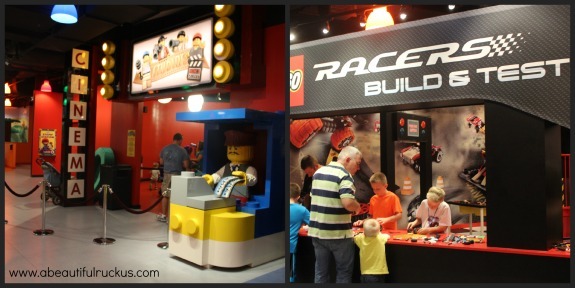 who LOVE legos, so we'd love to visit LegoLand! I LOVE sea creatures, and am a marine science major. I can't just choose one attraction that I'm excited to see! LEGOLAND! My kids have been itching to go, we just haven't made it up that way yet. Both would be a huge bonus! Hope I win - would love to go to Legoland!